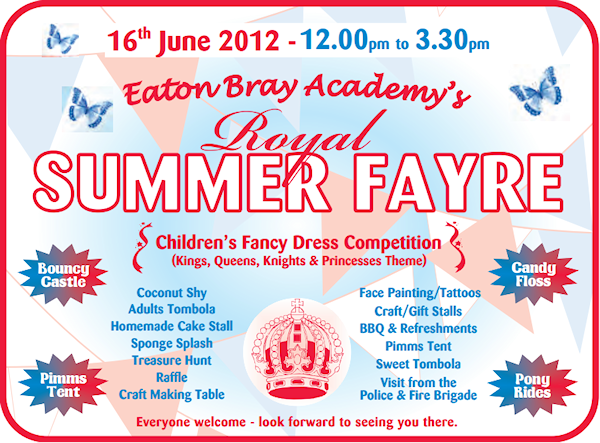 Archives of Eaton Bray News for June 2012. Hope you've been enjoying the few days of dry warm weather. There are going to be a few changes from September at Cheeky Monkeys that we wanted to let you know about before the end of term. As you know Heather is having a baby and as I mentioned earlier in the year my work commitments have changes meaning I can't commit to every Wednesday. A month or so ago we approached Jessie from the Beehive Sure Start Centre and asked if they would be able to support us. After several discussions with Jessie & Kim and the Centre manager Michelle we have decided the best way to ensure Cheeky Monkeys continues to stay open and running the way it is, is for The Beehive Centre to take over the organisation and week to week running of the group and we become parent helpers. Kim and Jessie will be there every week along with any parent helpers that are available each week. Kim and Jessie will be coming along on Wednesday 4th July to meet everyone and to see who would like to become official parent helpers which means you will need to be CRB checked. The website will continue to run so you can see what is happening week to week but the facebook page will close. We will also be giving your consent forms that you filled in when you started at Cheeky Monkeys to Kim and Jessie so they can update you as we have but they will not pass on this information to another parties. If, however you do not want you details passed on please let us know. Also to remind you that next week is the last week of Cheeky Monkeys, that is the 4th of July and Cheeky Monkeys will return on the 12th of September. Thank you to everyone who has helped with setting up, washing up and tidying away each week, with out your help Cheeky Monkeys wouldn't run. We will need your continued help from September too please!! And thank you for supporting us too, we have really enjoyed the past 15 months, we do hope that you will all continue to support Cheeky Monkeys as its such a nice group and a vital resource for the community. Finally, good luck to Heather and the imminent arrival of her baby and to Rika who will be returning home in a few week to hopefully starting her Pediatrics Nurse apprenticeship. If you have any questions just email or speak to us on Wednesday. Bedfordshire Police Authority have agreed to commission further work to examine the option of outsourcing the delivery of support services across Bedfordshire, Cambridgeshire and Hertfordshire. In parallel, the Police Authority also instructed Bedfordshire's Chief Constable to develop and take forward, in consultation with the Police Authority, a second option in the best interests of Bedfordshire which can be developed to full business case. In both cases they also agreed that the final decision will be taken by Bedfordshire's Police and Crime Commissioner when appointed in November this year. For the outsourcing proposal to move forward as recommended by the three Chief Constables, it needs the agreement of each police authority. Hertfordshire Police Authority agreed to commission the work at their meeting earlier this week (Monday, 25 June), while Cambridgeshire Police Authority met yesterday (Thursday June, 28) to consider the recommendation. The move comes as part of the on-going collaboration between Bedfordshire Police, Cambridgeshire Constabulary and Hertfordshire Constabulary which, along with the three police authorities, have established a Strategic Policing Alliance. The business case will examine in detail the outsourcing of these services through the existing Lincolnshire Police contract, which has G4S as the supplier. Following the consultation from earlier this year regarding the addition of an all-weather pitch on The Rye Recreation Ground, a planning application has now been submitted to Central Bedfordshire Council. Please see Planning Application CB/12/01812/FULL – The Rye Recreation Ground for full details. This Sunday witnessed a game of cricket that will live in Club folklore for a very long time indeed! Playing in the Yorkshire Tea National Village Cup regional Semi Final at home versus Everholt. Batting first the Bray had an early wobble being 24-2. losing Alden for 6 and Hosking for 3. A steady partnership between skipper Norris and young Flecknell took the Bray to 72-2. At which point Norris was dismissed for 33, and shortly after Flecknell departed for 24. What happened next the England team of 1990s would of been proud of. Subsiding from 72-2 to 85 all out. Eversholt's talented bowlers proving too much for the Bray's young middle and lower order. After another wonderful tea a subdued Bray took the field. However, miracles can happen in cricket, not that many of us believed it was today!! Having reached 42-2, Eversholt looked favourites to progress, but the skipper kept reminding us "a couple of quick wickets and anything would be possible!" Which is what happened! An inspired spell of leg break bowling, or straight onners as Wes the keeper said) from Jim Flecknell ripped out Eversholt's middle and lower order in pretty quick time. Jim finishing with 6-23 from his 8.1 overs. Norris 2-21 from 9 and Ellerton 1-26 from 9. Some exemplary fielding and catching from the young Bray team, with several super catches (Adam Harvey, Ryan Peacock both taking stunners), a run out (a Peeky / Greeny combo) and several diving stops (and non stops - from the author! ), backed up the tight bowling from Eaton Bray's 3 main bowlers. Eversholt eventually being bowled out for 73 to send the Bray into the Final! The final wicket, Lichfield (who had already showered and changed before needing to pad up!) caught behind off Flecknell for 0, brought a sizeable cheer from the small Eaton Bray section of the crowd and produced a proper team Hug in the middle. And then the incredible sight of the skipper buying a jug!! Now the author needs to avoid going to a Test match the day before the next round!! The A505 Luton Rd and A5 High St. North in Dunstable will be temporarily closed for the Olympic Torch Relay between 6.00am and 10.00am. Further information is available by calling Central Bedfordshire on 0300 300 4857. NW is an independent voluntary organisation supported by, but not run by, the Police. The most important element in the organisation is the Individual Member. Residents in a street or any other small area can get together to form a Scheme and Schemes can be grouped into Areas, as determined by convenience or geography. Schemes are very easy to set up, with one or more co-ordinators per street. As a guide 20 houses are about the maximum number for a Scheme, but the number can be as flexible as necessary, as long as it is manageable. If you are interested in joining NW and /or setting up a NW Scheme please contact the following email address [email protected] This will pass your message on to the appropriate Area Coordinator who will then contact you to take your interest further. Trading Standards is warning residents to be aware that the Top Roof Coating and First Choice Property Maintenance have been cold-calling at homes recently. Chris Holden from Buckinghamshire Trading Standards states that "The companies have both attempted to deceive consumers into believing that they need urgent or unnecessary work carried out on their roofs and failed to provide written cancellation rights, as required by law. Subsequent inspection of the work has also found it to have been unnecessary and very over-priced." If you are approached by anybody purporting to be from either of these companies, or indeed any company making similar claims, you are advised to decline any offers of work until you have had the opportunity to seek a second opinion. Trading Standards would be grateful if any such approach is reported to them, or if you have had work done by either company and have concerns, call them on: 08454 04 05 06. Chris Rowson, Ryan Holden, Paul Dorman The three of us are riding from London to Paris to raise as much money as we can for the Institute of Cancer Research. Our reasons for doing this do differ, but one common theme is that our lives, and the people we love have all been affected in some way by this disease. Please take the time to read why we are doing this. Thank you. Chris - Just over 3 and a half years ago my mom was diagnosed with Leukaemia. She started on a course of treatment, went into remission and started back at work. A few months after, the disease returned. She underwent treatment again, but the doctors could not cure her. My mom was so brave throughout, and showed amazing strength. Every time something gets difficult for me, thinking of what mom went through, gives me the strength to carry on. This is an opportunity for me, with your generous support, to raise money for aid the research into all types of Cancer so life saving treatments can continue to be developed. Thank you. Paul - I've always wanted to do an event to raise money for charity and when this opportunity came around I couldn't refuse. Everyone has been affected by Cancer one way or another and it really hits home when it's someone close to you, in my case my Granddad and my good friend Ryan. To see people go through this ordeal really makes you want to do something about it. With everyone's help and generosity we can raise a large amount of money for such a worthy cause. Thank you. Our charity will receive your money quickly and easily and if you are a UK taxpayer, an extra 25% in tax will be added to your gift at no cost to you. The Carnival is now only a month away! If you want to be involved now is the time to do it. The theme for Carnival 2012 is "Kings and Queens". We are not just talking Elizabeth, Edward, Victoria, George, Henry and Ethelred; there is Cleopatra, Martin Luther, Arthur… not to mention Freddie Mercury, Queen Bee, Sing-a-song of sixpence, 'hiking', 'checking' etc! Use your imagination for the theme; decorate your house on the Carnival route and join the procession in costume to make this a Carnival to remember in Queen Elizabeth's Diamond Jubilee year. We hope 7 July will be a special day for this year's Royal party. The Queen, Princess and Attendants were selected on 15 April so no doubt, by now they will be very excited. We hope they all enjoy their special day. See the Carnival Queen page for photos. As usual there are plenty of new ideas and things to do at this year's Carnival including the introduction in Olympic year of Village Games. Do come along. There is free admission, free parking and free entertainment. We hope this year's Carnival will be one to remember but we do need your help! URGENT - Can YOU provide any help to the carnival? Are you available to make the day a success by helping with moving equipment on the day and/or the evening before? The Carnival cannot operate without chairs, tables, tents and other equipment being delivered to and moved around the green and then removed at the end of the day. Can you lend a hand? Cakes for the Tea Tent and Cake Stall• Items for the silent auction. For any of the above please contact Gordon Gray. We have now reserved our spot at St Mary's carnival in July and are busy making plans and preparations for our stall. This year we have decided that we want to raise funds to support a local cause again. We have decided that we want to provide a service aimed at keeping our local primary school children safe when they are out and about – on their bikes, walking to and from school etc. As such, the club has pledged to raise enough funds over the next couple of months to purchase a high visibility waistcoat for every primary school child in our villages. We have been speaking with the schools to ascertain the number of children this covers and realise this is no small task, however, our aim is to have these items in the schools by the time the children return after the summer vacation! With that in mind, please come and see us at the carnival to find out how you can help and what other projects we are currently working on. Remember that every penny donated to Lions gets used to support our causes – we do not draw any administration charges from the club. As always, we continue to look for new members. We will be out and about much more over the summer months so please do come over and say hello and find out a little more about your Lions club, how it can help your community and how you can get involved.In one of our earliest articles we wrote about the Lions message in a Bottle campaign. You may recall that his scheme is free to the user. Whilst it is focused on the more vulnerable people in our community, anyone can fall downstairs, so this scheme can benefit anyone, including you. As a minimum it will save the Emergency Services valuable time identifying you and your emergency contacts. By telling whether you have special medication or allergies or not, it is a potential lifesaver and provides peace of mind to users and their friends and families. We have secured a large batch of these bottles recently and are hoping to make them available within the community at places like the pharmacy. For more information, please do contact us by emailing [email protected] – if these little bottles make a difference to just one person we will have done something good for our community. In the newspaper today I read an article that stated "The days of letter writing are over". Well, with postage stamps at such a high price that's a "may be", but, oh, there is a great joy to be had by some of us when the postman delivers a handwritten letter from an old friend, or a postcard from an exotic country, that I in my "old age" will never visit; or perhaps a birthday or congratulatory card; along with the mountains of junk mail that I seem to get. W.H.Auden wrote the poem, The Night Mail, which makes the claim, "And none will hear the postman's knock without a quickening of the heart, for who can bear to feel himself forgotten?" So many of my generation do not have access to the internet, do not send or receive E-Mails, cannot send text messages, and really do not want to become addicted to the small screens. Things like Kindles and I-Pods etc. are like a foreign language to me; I like to read with a proper book in my hands. One of the leasures of belonging to the older generation is that the need for speed is not a necessity. Ecclesiastes chapter 7 is headed in my Good News bible, "thoughts about life." Verse 29 says: "This is all that I have learnt. God made us plain and simple, but we have made ourselves very complicated"
To get back to the mail; if letter writing is to be a thing of the past tell all the philatelists to hold on to their collections; soon they will be worth a small fortune - especially if they have a unique stamp, such as a 1 cent black-on-magenta British Guiana (now Guyana) printed in the capital, Georgetown in 1856. One was sold in 1873 for the equivalent of 30p. In 1934 it was resold for £7,500, in 1979 it was valued at £350,000. Today who knows? Letters written in a bygone age, peoples' signatures become collectors' items. These are not things to be discarded, destroyed, or thrown out willy-nilly. They are treasures and will become our heritage. And with good grace as I know I could. To the face of another, a happy smile." Letters do that, write one today. These are an example of letters written by children to God. "I sorry did not write before but I only learned how this week. Martha. I am five." "Dear God, If we had fur like animals we wouldnt have to wear clothes. Did you ever think of that. Walter." "Dear God Last week it rained for 3 days. We thought it would be like Noahs Ark but it wasnt. Im glad because you could only take two of things, remember. And we have 3 cats. love from Donna." "Dear God Why do I have to pray when you know anyway that I want? But if it makes you feel better, Ill do it. Sue." Letters like this always reach there destination, no cost involved! Outsourcing of police support services in Bedfordshire, Cambridgeshire and Hertfordshire is being considered as part of continuing efforts to tackle the £73 million shortfall in police funding for the three counties. Police Authority members in the three counties will be asked to consider later this month (June) how services including HR, finance and ICT could be outsourced in future as part of a joint recommendation made by the three chief constables. The move comes as part of the on-going collaboration between Bedfordshire Police, Cambridgeshire Constabulary and Hertfordshire Constabulary. A recommendation that a full business case should be developed to scrutinise this proposal in more detail was discussed on Wednesday (May 30) by the Police Authorities Joint Collaboration Working Group. As a result, it was agreed that each of the three Police Authorities will be asked in late June to consider formally the commissioning of a Full Business Case for outsourcing support services through the existing Lincolnshire Police framework, with G4S as the supplier. If agreed by all three police authorities, the earliest that outsourced services could be in place would be April 2013. Does THAT Car Belong In Your Street? Bedfordshire Police are urging residents to remain vigilant and to report any suspicious or abandoned vehicles in their area. In recent week there has been a slight increase in burglaries across the county where thieves are looking for car keys to steal the homeowner's vehicle. For most people, a car is the most expensive possession that they own and for this reason detectives are keen to reunite stolen property with their rightful owners as quickly as possible. Newer cars generally have a security system in place which makes it almost impossible for the vehicle to be stolen without the keys. For that reason, thieves are committing burglaries specifically to steal car keys and any other valuables that are nearby. To help reduce the risk of car theft, Bedfordshire Police is urging motorists not to leave their car keys or valuables anywhere where they can be easily seen from outside or within range to be 'fished' through the letterbox. Detective Chief Inspector Steve Vesztrocy said: "One of the greatest tools that Bedfordshire Police has in fighting crime and protecting the public is the 550,000 pairs of eyes and ears that belong to the residents. "As we continue with our attempt to lower auto burglaries I would ask for the public to remain vigilant and not to hesitate for a moment to report anything suspicious. Have you seen anyone paying particular attention to cars or houses in your road? Is there a car parked up that isn't ordinarily in your street? Have you seen somebody driving a car that isn't theirs? If so, let us know." If you have information relating to burglaries, vehicle theft or have spotted an abandoned vehicle in your street, contact Bedfordshire Police, in confidence, on the non emergency number 101, or text information to 07786 200011. Everyone welcome - look forward to seeing you there. You are viewing the June 2012 archive.